The Thug affectionately named "Phil" by stable staff won very well over the 2100m at Lakeside Park Sandown on Wednesday. Damian Lane who has ridden him in most of his starts, rode a very well timed race to win by half a length. Damian let the horse slide forward from a wide barrier keeping him well balanced, as the track was not in the most perfect of conditions as the races were abandoned after the race 3. On the home turn Damian gave The Thug more rein to slide alongside the Robert Hickmont trained Morning MIx who was leading. These two came away from the rest of the field with The Thug winning the battle. 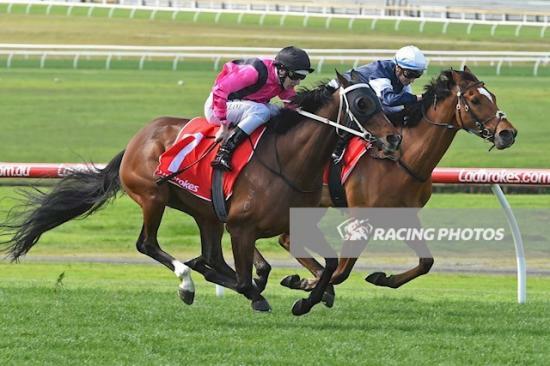 Since having the blinkers on The Thug has been racing with a lot more confidence and zest, recording a 2nd at The Valley and this Sandown win. Cameron Racing feel The Thug will continue to race around the distance of 2000m with a nomination into the Benalla Cup to be run over 2046m very likely. With a light weight would be very competitive. For a small outlay The Thug is really rewarding his owners as the Sandown win put him into the triple figure prize money. Congratulations to all the winning owners and a thank you to Damian for a great ride.